A perfect fit in the kitchen or dining room, the Amish American Mission Counter Height Dining Table makes a great spot for casual dining and family gathering. Simple mission style with square top. Counter height tables make a smaller space look bigger due to their added height. This mission table has wood slides. Wood slides are a delight to use and provide maximum support for leaves added to the table. Wood slides will never rust. DutchCrafters is home to a large variety of mission furniture for every room of the house. Amish craftsmen put their heart and soul into the furniture they make. Enjoy shopping from home and creating the exact furniture you envision with our custom options. If you'd like assistance, we'd be thrilled to help. 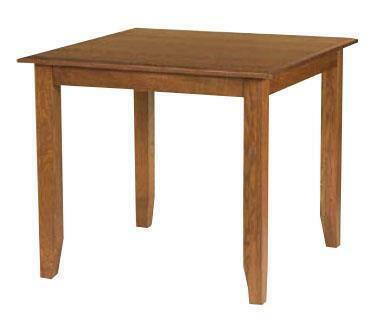 Amish Furniture Specialists can be reached by email or phone.